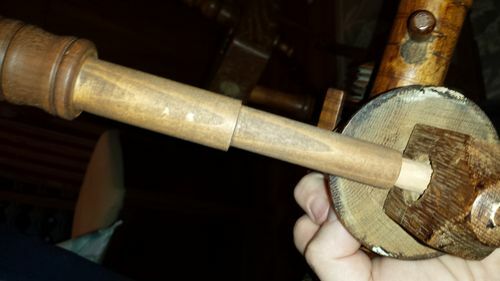 I am repairing an old spinning wheel my daughter bought at an estate sale (I wish she would stop doing this…its her third one in a year ;) It is in darn good shape for a 19th century wheel which obviously has a lot of miles on it, but it still apparently needs some of Dads humble woodworking skills. 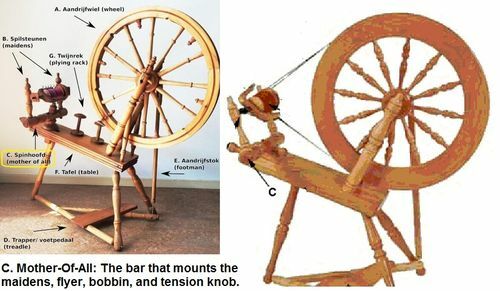 The only relevant part that is missing is a wooden screw that adjusts the tension on the heart of the spinning mechanism (known as the Mother-of-All). 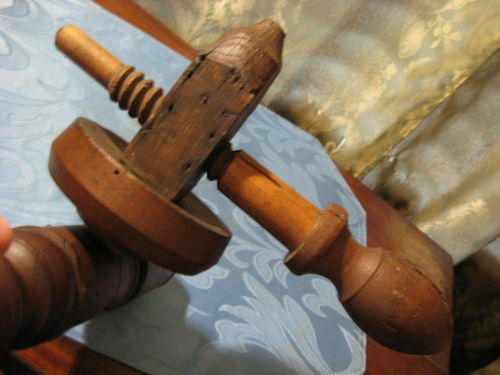 The “nut” part is there and in fine shape, but the screw is gone. Hence this question, which is probably an easy one or has an answer obvious to one and all…except me. I am not quite sure how to measure the pitch of the screw. I plan using calipers to measure the small inside diameter of the female hole (aka the “nut”), as well as the large diameter to get the screw thread depth I need. I would rather not result to my usual approach: make a prototype that will be turn out too large, make the next prototype which will no doubt be too small, and iterate until it is either close enough or I get frustrated and start over. I don’t have the nut in front of me, but the hole is about 1” or 1.25” dia. Enough room to measure things at least. I have not used either of these kits but if end up having to make new complete parts might be worth a look. Do shop around for best price if decide to go this route. You might like this kit if they have your size thread. Need a router with ths set. Have second video worth watch too. This style has been around for long time and once lot cheaper than now. Some turners here use something like this for making face plates and other accessories. If you can’t figure out how to measure the pitch, you could buy one of those kits and make a new nut to match your new screw! You might shoot this guy an e-mail expining the problems you are having. Asking for help & advice! 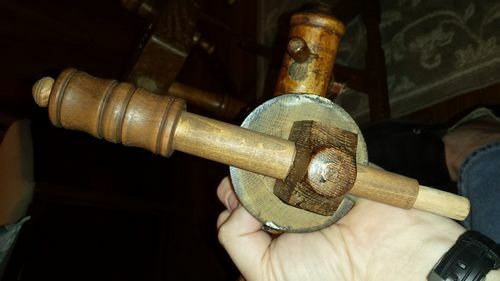 You might get away with using a metal threaded rod and metal nut and just making a handle. From what I gather the mother of all use to adjust tension not exactly sure. 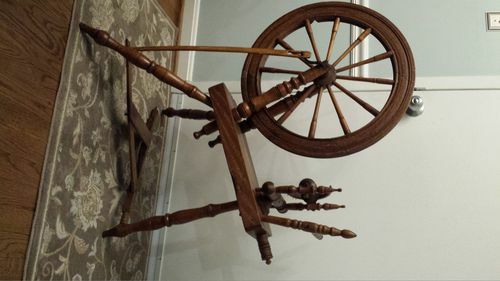 Not all spinning wheels have a mother of all just not sure how they work or maybe called something else. Looked several video’s including one you posted and sure looks like a lot of hard work. Can tell you from experience don’t want to use soft woods because threads do crumble. Tried hand chasing threads & CA glue method and not very impressed. I would take my parts to a maching shop and ask them to measure the threads. This may sound a bit odd but just may work. Wrap a small cylinder of modeling clay in plastic cling wrap and press it into the threads on about 1/8 – 1/4 of the inside diameter of the nut and then gently lift it out. Even if you cannot get it all the way to the bottom of the threads, you should at least be able to measure the pitch. Then try it again with a smaller piece of clay to get the depth of the threads. 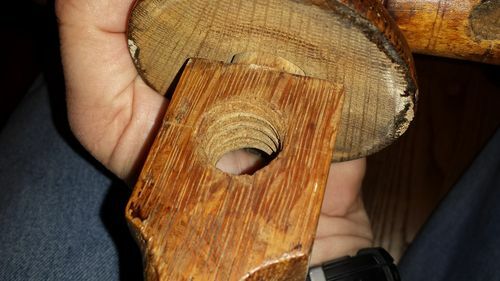 Or make a screw/nut set to your own specs and turn the nut down to a thin walled sleeve that can be glued into the bored out hole of the original nut. This would best be done with some good hardwood to keep the threads intact. there is a whole assembly for sale on E-Bay for $70 if you wanted to keep the authentic look. 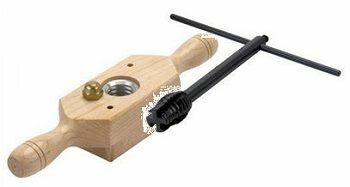 I have a Wood Threading tap and die that takes a 1” dowel and makes a 1” x 6tpi screw. if that is the size you need, I can send you one and you can turn the main body on a lathe. John. That is amazing! I’m a big ebay guy, but never even thought of searching for such a part on ebay. 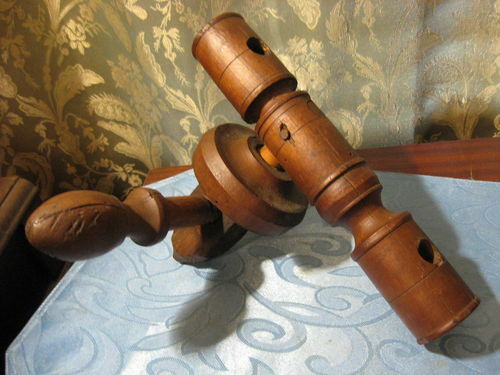 I need to make a replacement for that spindle with threads to work with this threaded hole. This is a good learning project for me. Making the overalls spindle, getting a nice handle on it, and the over all length and diameter are just my speed. I ‘m going to try one of several router table based methods I found to cut the threads. Lots of cheap pine as test projects coming up !